Want to start an after school French club at your school? 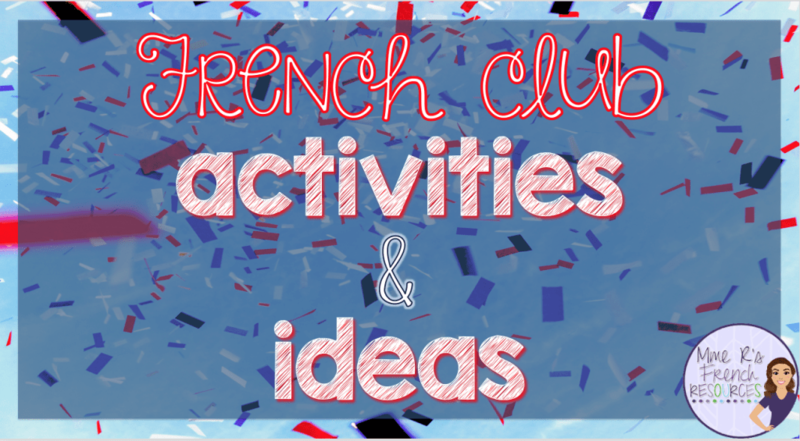 Need some activities for your existing French club? Taking on any new task can be daunting, but it’s not as hard as you think! As with any new venture, you’ll most likely need to run it by your administrator first, so before you ask him or her for a meeting, be prepared! 2. Why do you want a club? I wanted to provide a safe place for my students to be after school. In addition, I was able to provide enrichment for my students, do fun cultural activities that I never had enough time to do in class, and of course… EAT! We also had little or no funding for field trips, so while I was not often able to take all of my students somewhere, I was able to do some fund-raising with the French Club and go to places like the theater or a museum. 3. Where and when will you meet? We met in my classroom every two weeks after school. It’s easiest to meet at school, but you’ll have to compete with other extra-curricular activities. I scheduled my meetings on Friday afternoons, because most of my students didn’t have activities, and getting to homework wasn’t really necessary on Friday night. 4. What will you do? I’ll get to more activities later, but for purposes of talking to an administrator, I’d focus mainly on the activities and ideas that I have form my French club. For me, the French club focused a lot on culture, so we watched movies, ate foods from Francophone countries, listened to music, and made decorations for my classroom. Now, what activities do you DO in French club? It really depends on the students you have, because you’ll decide if your club will be French-speaking only or if it will be open to beginners who don’t speak much French – or even Spanish students who really want to participate! I saw it as a way to connect with kids, so I didn’t want to exclude anyone. We spoke a lot of English, but we did a lot of French-speaking, too. I focused a lot on Francophone culture, and although my background is French, I tried to bring as much in from other countries as I could. Of course! Now, I love French food, so I’ll never turn down a chance to eat! However, I loved to encourage my students to find recipes from a lot of different French countries, so we got to eat some yummy things, such as Yassa (an amazing Senegalese chicken dish), couscous (Algerian), waffles (Belgian) with real maple syrup (Canadian), and of course, lots of baguettes and cheese. Depending on your club size, you might have all students bring something each month for a potluck, or you could divide it into groups so that students don’t have to bring something to every potluck. Whatever you decide, it’s a fun idea to encourage them to only bring a food from a specific country once, so that the next time they bring a dish, it would be from Morocco, Canada, Switzerland, Tunisia, or anywhere OTHER than the dish they brought the last time. Here are some movies that are great for watching with students. I haven’t put some of the common classics, because you may already be watching these in class. These are a few that I’ve watched for parties or special reward days with my classes. You can also put the French language track on most English language movies now if you still have a DVD player. Just look on the back of the box to see what tracks are included. Most North American DVDs will have tracks in French and Spanish, but not all. Check the ratings, as some are PG-13! Before showing ANY movie to students, be sure to watch it first. Only you will know what is appropriate or will appeal to your students. À la folie, pas du tout – One of my favorites, but watch it for content if you have younger students. I only showed it to 16-18 year olds, but it was the favorite movie of everyone, so it’s worth watching just for yourself. 1. Had a karaoke contest. I don’t have a machine or anything, but I just found videos with the lyrics and we did sing-off competitions. It was so much fun, and your extroverts will love it! Your less-extroverted kids will still have a ton of fun watching! 2. Played the freeze game. Basically, play some music, have them strike crazy poses, and freeze when you turn the music off. 3. Make music videos. This one is a hoot! It takes time, so we dedicated a few meetings to planning, practicing, and recording. What are my favorite activities for French club projects? 1. We made a French flower stand. I had all of these small pieces of square tissue paper that I found in a cabinet (who knows how long they’d been there), and we used them to make flowers. We made tons of stalks and put them in these cheap bins that I found at the dollar store, and then we painted a Fleuriste sign. I put the whole display in the corner of my room. 2. We made a door poster with French monuments we cut out and colored. I hung it outside my room. 3. We made a bulletin board for Carnaval de Québec. Students researched the Carnaval online and printed out pictures of previous ice castles. Someone wrote a news piece about taking a snow bath, another student wrote about her interview with Bonhomme Carnaval. We had a Halloween/Toussaint/Día de los Muertos party with the Spanish classes. We organized a big party after school, and we had games and activities, music, and food. I taught a salsa dancing lesson, and we had a crêpe stand. We invited the middle schoolers to come and charged $2 entry. It was so much fun, encouraged the middle schoolers to take foreign language, and helped us raise some money for field trips. You can do a similar thing for Christmas or Valentine’s Day. If your students love poetry, give them poems to memorize and recite. You can even have prizes for the best recitations. I’ve had groups who absolutely love this, but other years, my kids would not have it. At all. Everything depends on the students’ interest, so run it by them and if they say no, okay. If some want to do it, it’s okay to break into groups. Give them some say in what you do, because it’s their club, too. Chances are, they’ll have some fun activities and ideas you’ll want to try out. You can play games like Bingo, which will focus on French, but any board games are fun. You can teach a few French phrases for game play and write those on the board. This will encourage students to speak French, but it won’t be so educational that they will feel like they are in class. I love to hunt thrift stores for board games, and my collection is HUGE! In the end, the goal is to have fun. You want to expose them to Francophone cultures, you want them to learn some more French, you want to connect with them outside of class. Don’t worry if it’s not 100% in French all the time if that is not where your students are. Just start with a few things you like, brainstorm some ideas with your students, and have FUN! Any other French club activities and ideas? Comment below!